Ceramic glazes vary widely in their resistance to wear (cutlery marking, scratching) and leaching by acids and bases. The principle factors that determine durability are the glaze chemistry and firing temperature. In industry technicians are accustomed to evaluating glazes by looking at their oxide chemistry and rationalizing the relationship between it and fired durability. Glazes having plenty of Al2O3 and SiO2, for example, are more durable (when they are melted properly). By contrast, potters tend to focus on the recipe. This is a problem and it is the reason that potters can be found using very non-functional glazes (often flux saturated and therefore lacking in Al2O3 and SiO2) or firing them in a non-functional way (e.g. under firing). Misconceptions are common in this area. 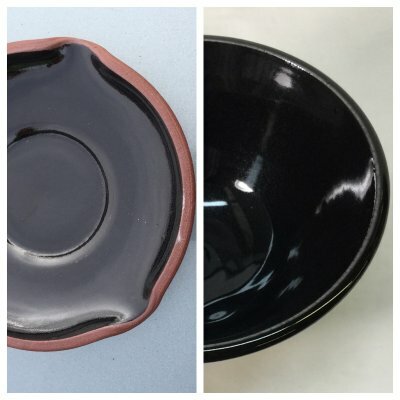 Many feel that just because a glaze looks melted it is durable. Another common belief is that firing temperature is an indicator of durability, the higher it is fired the more durable it will be. These beliefs, when coupled with the active traffic in glaze recipes online, greatly increase the chance that non-durable ware will be made. 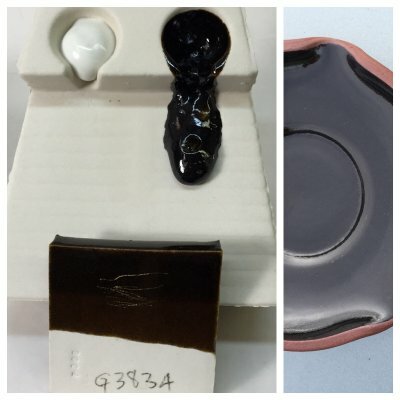 Sadly, a large proportion of online glazes are not durable and possibly not safe, even though they are published in fancy formats from apparently reputable sources. It is thus important to have a critical eye when looking at new recipes. Another factor in why many people are using glazes of poor durability is the lack of appreciation of the basic science. In excess of 99% of glaze recipes available are for special purpose colors and surfaces. But very few quality transparent recipes are available. Ones that are expansion adjustable, fire clear and transparent, work with stains, have the right melt fluidity, melt well yet do not blister or pinhole, are easy to use, etc. And people do not test these with their bodies and adapt them (e.g. thermal stress testing for shivering, crazing). But functional surfaces must be based on these. Further, most other glazes are simply transparents with added colors, opacifiers and variegators. With some experience it is possible to quickly judge durability issues when looking at a new glaze recipe. For example, at low temperatures (cone 06-04) boron is essential, so we expect to see a significant frit presence (or a natural boron source like Gerstley Borate), up to 80% is not uncommon. At high temperature we expect to see no boron materials (feldspars, calcium carbonate, dolomite, wollastonite, strontium carbonate are active melters there). At middle temperature these do not melt well so they need help. That help is almost always boron, so you will see 10-40% frits or Gerstley Borate. Some middle temperature glazes use zinc and/or lithium in addition to or instead or boron (these are power melters). But it is important that melters not be in excess, this will make the glaze leachable (since the SiO2 and Al2O3 percentages are pushed down). At all temperatures, you should see clay in the recipe. 15-30% is typical. At all temperatures you should see silica, from 5-40%. If there is no clay or silica that is a red light if it is supposed to be a durable functional glaze. Testing durability is common sense. Expose it to an acid and to abrasion and scratching by hard materials. Please see the Limit Formula glossary topic for more information on how to look at a formula and judge its balance.